This week there was news the Choose Your Own Adventure (CYOA) book series is to be developed into a film series by 20th Century Fox. Launched in 1979, the series was enormously popular throughout the 80s and 90s, sold over 250 million copies and is still published today. The movie announcement got me thinking about how these books played yet another part in my personal growth as a gamer. The CYOA series follows the form of a gamebook which allows a reader to participate in how a story unfolds through a a variety of choices made along the way. 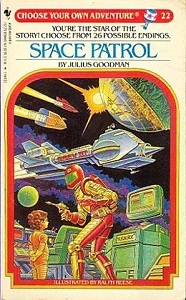 To a young kid, the CYOA books shared a lot in common with my role playing game interests. 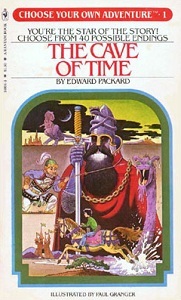 Each book presented a fantastically-themed self-contained adventure, International travel, outerspace journeys, crime investigations and sword and sorcery tales filled the pages of each paperback, and collecting them was part of the fun. Choices made while reading each story could take you to more than 20, 30 or 40 different endings to the book, making for a lot of re-reading value in seeing how things might turn out differently each time. The CYOA mechanic provided the feel of a solo game for when no one else was around with which to play something a bit more complex like D&D. Looking back from today, the structure of jumping back and forth through the narrative is akin to the experience of clicking through hyperlinks online. Even videogames today like 2012’s award-winning The Walking Dead series from Telltale Games share in the basic chapter and choices format people of my generation grew up on. There’s no telling what shape the proposed Choose Your Own Adventure movies series will take, and it may prove to be yet another Hollywood move to attempt to cash-in on a known property. That said, it’s interesting to see just one more way these books continue to ripple through the culture over 30 years later. Collector’s Note: The Choose Your Own Adventure series is still published today and can also be picked up fairly easily used starting at about $3-5 each on eBay. For true collectors, first editions from books early in the series can go from hundreds or even over a thosand dollars from rare book dealers like AbeBooks.